With 3000 Twitter celebrities and counting, Tweetwood is the biggest portal of real twitter celebrities. Tweetwood solves the problem of fake celebrity accounts on Twitter. All the Twitter celebrity accounts present on Tweetwood are added using an unique algorithm and are manually verified by Tweetwood staff. Need to find real account of Justin Bieber on Twitter? Simply type his name in the search box. The algorithm behind Tweetwood engine considers a lot of other factors besides Verification by Twitter, number of other celebrities following the account, influence of the account through its tweets etc. The categorization of celebrities based on the country and area of expertise makes it easy to track one’s favorite celebrities on Twitter. Want to see tweets from Hollywood celebrities on Twitter, simply go to the US Celebrities portal and click on Entertainment. Twitter has revolutionized the way celebrities communicate with their fans. Tweetwood takes it one step further and presents users a feature rich website that focuses only on twitter celebrities. It allows users to follow their favorite celebrities without having the need to follow them individually or worry about the authenticity of their twitter accounts. Along with all the standard functionality users see on twitter, Tweetwood has a number of unique features that enhances the user experience many folds. Twitter Conversations makes it easy for users to track and share conversations between celebrities on Twitter. Twitter trends gives users a quick glimpse of what is trending among celebrities. Trends on Tweetwood are different from Twitter trends as they are based on celebrity tweets which are a better measurement of popularity. 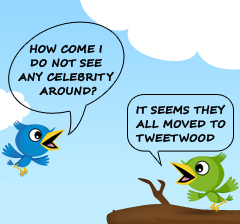 Tweetwood is currently available for US, UK, Cananda and Indian Celebrities on Twitter. From Lady Gaga to Drake, Ricky Gervais to Amitabh Bachchan on Twitter, You will find almost all international twitter celebrities on Tweetwood.